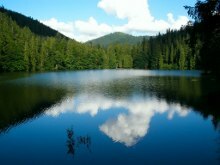 Carpathian Mountains, castles, wine, cheese, and friendly Transcarpathia are waiting for you. The two-day tour is offered every weekend. 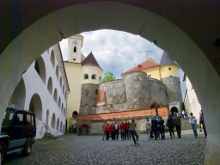 The tour gives acquaintance with the history, customs, culture and religion of the five ethnic groups in Transcarpathia: Boyko, Lemko, Hungarians, Gypsies, Ruthenians; with best dishes of Boiko, Hungarian, Lemko cuisines; most outstanding historical monuments of the land: Schonborn Palace, Mukachevo Castle, the historic center Beregovo, panoramic view Vinogradov Castle, Korolevo Castle and Khust Castle; beauty of the Carpathian mountains, Synevyr Lake, Shypit Waterfall, the opportunity to take photo in the picturesque place of the Carpathian Mountains, swimming in Beregovo thermal pool; tasting different kind of ecological cheese, which is made by Swiss technology in Selysche dairy; tasting the best vintage wine in Transcarpathian ancient wine cellars and tasting wine of private owners of Beregovo district. 1st day (Saturday): departure from Lviv (08:00), Health resort "Carpathians", Schonborn Palace (excursion), Mukachevo (excursion around the castle and lunch), Beregovo (swimming in thermal pools, wine tasting), Beregovo district (accommodations in the Hungarian green tourism estates). 2nd day (Sunday): breakfast and departure (08:00), Nyzhne Selysche (cheese tasting), Synevyr Lake (walk excursion and lunch), Pylypets (Shypit Waterfall), Lviv (return at 22:30). Accommodation in comfortable cottages (Berehove district): double rooms and triple rooms with bathroom and shower. Dinner and breakfast ordered on site. Dinner consists of Hungarian cuisine dishes: bob-at Kettle goulash, Hungarian cabbage rolls, Hungarian sweets and wine (40 UAH/person), breakfast is the usual European (20 UAH/person). Lunch on Saturday is in Mukachevo (the restaurant "Riviera") and consists of dishes Lemko-Mukachevo cuisine. Cost 45 UAH/person. Lunch on Sunday is in the restaurant near Synevyr Lake and consists of the best dishes Boiko cuisine. Cost is 55 UAH/person. Tour cost - 895 UAH per person + 205 UAH for entrance tickets and cheese and wine tasting + 200 UAH Beregovo thermal pool + 70 UAH per person for the chairlift.